J. Grace Pennington (of the blog that shares her name) has just recently launched her debut science-fiction novel Firmament: Radialloy, and has invited me to participate in her book tour. I got to interview her about her new book, and here's what I found out. 1. Other than C.S. Lewis’ The Space Trilogy, I haven’t read a lot of “science-fiction.” In light of that, can you bring me briefly up to speed on your book? Firmament: Radialloy is a Christian young-adult sci-fi book, the first in a series. It introduces us to Andi Lloyd, a young girl who works with her father, who is a doctor. That doesn’t sound very sci-fi, until you realize that her father works on the starship Surveyor, which has been their home for many years. But in the course of the book, mysteries from her past are revealed, the doctor starts mysteriously going insane, and various factions determine to gain a valuable secret her body holds. 2. Did you consciously choose to write a science-fiction novel or did the genre choose itself? Is science-fiction a genre that you read a lot of? I don’t read much science-fiction at all, though I hope to read more soon. I do, however, watch a fair amount of science-fiction, and I love it. Since the novel was somewhat inspired by Star Trek, I guess you could say the genre chose itself. I had, however, been interested in writing science-fiction for awhile before I wrote the novel, and had long been convinced that it was an important genre for Christians to be involved in. So I wasn’t adverse to the choice. 3. Tell us about your main character. Is she a lot like you, or is she pretty much her own person? Andi is a lot like me in many ways. She has some of the same strengths and weaknesses, but she also has some strengths that I lack and wish I had. For instance she’s very affectionate and sometimes sarcastic, with a good dose of doubt and impatience, like me, but she has a certain confidence and assurance in herself that I don’t have. So she’s a bit like a dramatized version of me, in some ways. 4. Would you mind giving us tasty excerpt from Radialloy to give readers a sense of your style and the book’s content? Positioned near the window was the small table, where the Captain and one or both of his close friends often shared a drink. I approached the Doctor and stood behind him, laying a hand on his shoulder. “Go rest, Gerard,” Guilders suggested, pushing his drink aside and moving a checker. “Would you do me a favor, then?” the Captain asked. “Yes sir.” I straightened up, prepared to take orders. “Cloths are in the cabinet. Thanks, Andi!” The Captain moved his piece. “Never learned,” the Captain said, studying the board. 5. What books or movies or people helped inspire Radialloy that were not science-fiction? Laurie R. King’s book The Beekeeper’s Apprentice was something of an inspiration. I liked the central relationship between Russell and Holmes, and how strong and deep yet bantery and realistic it was, and I wanted the same general feel for the relationship between Andi and the Doctor. Honestly though, most of the influences were science-fiction, other than general writing influences. 6. Who would you say this novel is written for? The target audience is Christian young-adults, so it’s geared for ages 13-21 or so. However, I intentionally made it very clean as far as content, so I hope that younger kids can enjoy it, and I hope that older readers will be able to enjoy the story as well. But the theme, the content, the tone, and the style was all written with teens and early twenties in mind. 7. I understand Radialloy is part of a series. What are the other upcoming books that readers can look forward to? The series is intended to be eighteen books long, and the other books are In His Image, Machiavellian, Reversal Zone, Gestern, No Man, Eleftheria, Humanoid, Intoxication, Till Death Shall Part, Timestream, Wandering Jew, Hypochondriac, Programming, Pandemonium, Phagocardiosis, Myopia, and Stars (titles subject to change). In His Image is written and awaiting revision, and Machiavellian is in the drafting stage. I’ve also written bits and pieces of scenes from Gestern, Till Death Shall Part, Programming, Phagocardiosis and Stars. I don’t like to lose good scene ideas, so I jot them down as they come to me. 8. Can you tell me what inspired these unique names? I’m going to do a whole post on titles later, but the short of it is that each title is based either on the theme or the premise of its corresponding story. Some of them are rather obvious, some of them are made-up words, some of them are cryptic and mysterious. As for Radialloy, that is a made-up word that is the name for the central object of the book. 9. Is the novel “overtly Christian,” or is it simply written on Christian principles? This particular novel is overtly Christian. Andi and her father are Christians, and there is occasional praying, Bible quotations, and the topic of God and Christianity frequently comes up. Not all my writing is overtly Christian in nature, but all the books in the Firmament series are. 10. I understand you have a busy year charted out with lots of writing projects in the wings. Roughly speaking, can you tell me how long it took you to write Radialloy itself? Yes, it’s going to be a very busy writing year! Radialloy took exactly sixty-six days to write, and two months is a pretty standard time for my novel writing. The revision stage was much longer, with at least ten revisions spread out over two years. But it was my first revision, and I had a lot to learn, so I’m hoping future revisions won’t be quite as hard. Thank you for having me on your blog, Jenny! You're very welcome, Grace! As for the rest of you, Firmament:Radioalloy can be purchased on Amazon in either paperback or Kindle edition. To keep abreast of J. Grace Pennington's work be sure to check out her website and blog, or follow her on Twitter (@jgracetheauthor). There are more books to come. Check it out! That graphic makes me giggle. 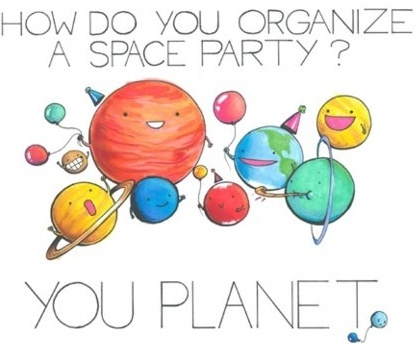 But poor Pluto! Great questions, Jenny; and great answers, Grace! I enjoyed learning even more about the book. And you write your novels in two months? ...I am currently somewhere between awe and pea-green envy. May I copy the exact comment of Abigail, please, pretty please?!!! Great interview on both sides. I have to admit that the more I hear of the book, the more interested I am to looking it up. Hmm! Ohh, I wish I can write books as quickly as you, Grace. How do you do it? I love all the names you've got for the series... really creative and intriguing. The excerpts and sneak peak at the titles of the future books get me even more excited about reading the first!